Congratulations, you are eligible to win the Smart TV for Me Sweepstakes. If you love entering sweepstakes, you will love iNever Win Anything. Check back daily for new sweepstakes giving you the chance to win cash, cars, gift cards and other prizes. Every day we search for new sweepstakes making it easier for you to enter sweepstakes. If you are tired of saying, “I never win anything” you found the best place to enter the top sweepstakes. Enter to win $10,000 cash in the My Daily Moment Sweepstakes. Your life could change in one moment by winning $10,000 cash. Spin and Win $500 Cash! 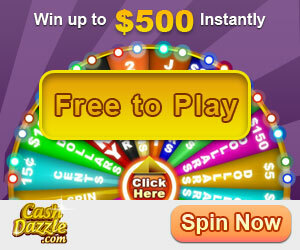 Spin and Win up to $500 Instantly with Cash Dazzle. This game is fun to play, and there are real cash prizes!